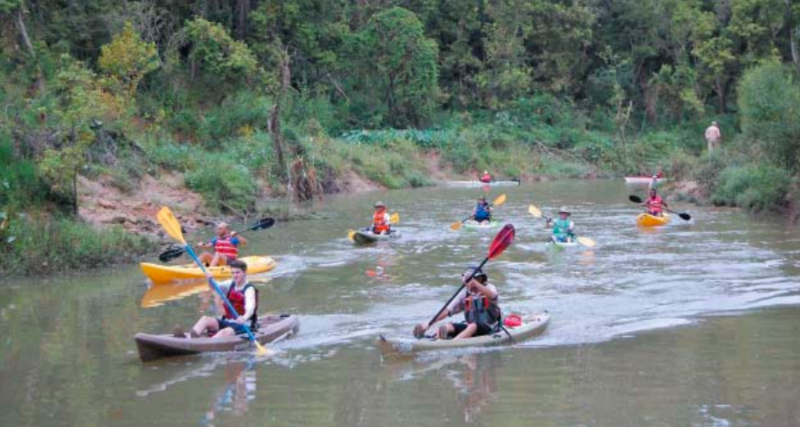 Paddlers came, paddled hard and raised over $10,000 in support of the Greens Bayou Paddle Trail. It was a successful event. Ninety-five participants raced down the Bayou on Saturday, October 13 at the 3rd Annual Greens Bayou Regatta. Mayor Sylvester Turner and Harris County Precinct 4 Commissioner Jack Cagle gave inspiring words to cast the racers on their way from Brock Park Golf Course. Fifty-nine boats arrived at Thomas Bell Foster Park for the finish line festivities, set up by Doug Coenen and a small army of outstanding volunteers. Thomas Bell Foster Park is a recipient of tremendous recent enhancements thanks to Global Care Day volunteers from LyondellBasell and contractor services by Craig & Heidt, Inc. Racers cruised into the newly cleared takeout site with ease and spectators welcomed them from the grassy bank. Racers then enjoyed a delicious hot meal donated and prepared by Mr. Barry Ross and his family and graciously served up by Rita Rodriguez and her crew. 11 Below Brewing ensured participants had the option of enjoying a cold beer after a long 7.5 mile paddle. During the closing ceremony, SWA Group was awarded the Corporate Cup with Jacob Galles and Garett Dietrick coming in first place (1:47:57) and Clark Condon’s Spencer Harvey and Jake Salzman in a close second (1:48:10). All other results from the race can be found here. Port Houston’s team, Garret Berg and Fatima DeLeon won The Styrofoam Cup – the award for most trash collected along the racecourse. They hauled in a canoe full of plastic bottles, Styrofoam products and even a cooler! The Top Individual Fundraiser was Christina Domalakes who won gear donated by Whole Earth Provision Co. She raised over $500 in sponsorship from friends, family and co-workers! This has set a record for the most raised by a single person! Aldine ISD Superintendent Dr. LaTonya M. Goffney delivers remarks as members of her Student Ambassador Group look on during Aldine ISD’s State of the District/AEF Breakfast on Thursday, Nov. 1. On Nov. 1, Aldine ISD held its annual State of the District/AEF (Aldine Education Foundation) Breakfast at the Hilton Houston North Hotel. 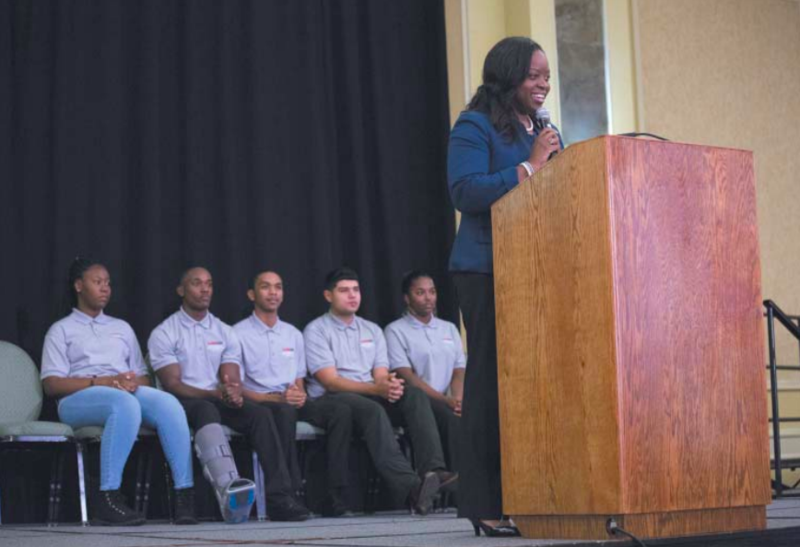 This year’s event was the first for Superintendent Dr. LaTonya M. Goffney, who was named Aldine ISD Superintendent of Schools in April. Members of Dr. Goffney’s Student Ambassador Group led the presentation and provided information on the district. The breakfast also served as the kickoff for AEF fund campaign. AEF President Richard Cantu spoke on behalf of the Foundation. Blanson CTE student Ariana Lopes Rodriguez opened the breakfast by leading the audience in the Pledge of Allegiance and the Pledge to the Texas flag. The colors were presented by the Davis High School ROTC. Victory Early College High School student Carolyn Garcia introduced members of the Aldine Board of Trustees who attended the event, Dr. Goffney and members of her Executive Leadership Team. She also introduced elected officials who attended, which included State Reps Ana Hernandez and Armando Walle, and Houston City Council member Jerry Davis. The audience was then treated to a performance by the All-District Choir, under the direction of Daryle Freeman, choir director of Davis High School. Davis High School student Sandra Garcia introduced AEF Board members and district stakeholders, which included students, parents and grandparents, business partner, community partners, and nonprofit and education partners. Board Vice-President Paul Shanklin delivered the invocation and after breakfast, Cantu delivered remarks on behalf of AEF. “Each year since 2012, the Aldine Education Foundation has joined Aldine ISD at this breakfast event to celebrate the successes of the previous school year and to learn how we as a Foundation can continually increase support for bigger, future successes,” he said. He explained the Foundation focuses its support in two major areas, scholarships for graduating AISD seniors and teaching grants to support educator excellence. Cantu said in the fall of 2017, AEF awarded 13 teacher grants totaling $60,268. In the spring of 2018, AEF awarded $66,000 to 80 outstanding educators to thank them for their dedication to the district’s students. Also in the spring of 2018, Cantu said AEF awarded $412,000 in competitive scholarships to 126 Aldine ISD students. AEF also informed 88 ninth through 12th graders across 11 campuses that they would receive their part of $30,000 in scholarship funding upon their graduation. Those students earned grades of 95 or higher in every class during the 2017-18 school year. CIP Facilitator Diane Sheridan, center, and others of the CIP group listen to Ben Gillis, tour guide for TransStar, as he explains the functions and facilities in the TransStar building on old Washington Road near I-10. In the background are live television monitors, showing traffic throughout the area. Tour guide Ben Gillis, assisted by David Wade and Misty Gunn, showed the 30 members of the group all the control rooms, monitoring stations, and other equipment that the facility has. 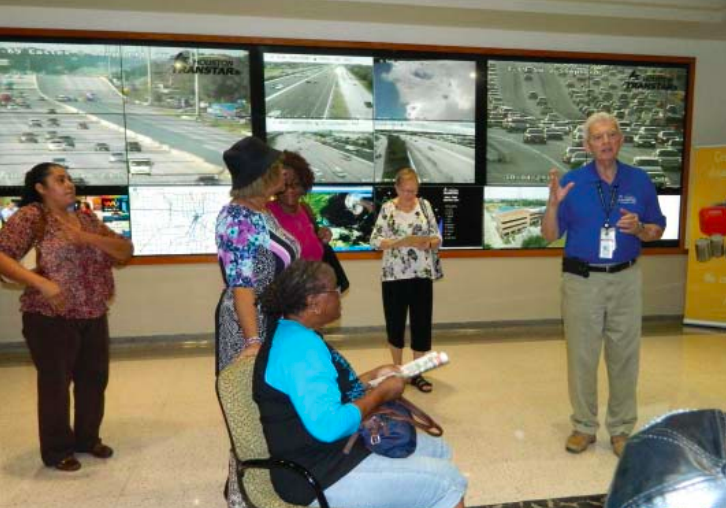 Houston TRANSTAR was established in 1993, and is a formal partnership with transportation and emergency management agencies in Harris County. These include TxDOT, METRO, Harris County, and the City of Houston. The goals of the transportation part of TranStar are to save drivers time, increase driving speed and minimize delays, and through those activities save money and help the environment. The goals of the Emergency Management part of TranStar are to save lives and provide help to those in distressed situations. Since 1979, there have been 46 federally declared disasters, averaging more that one per year. These include hurricanes, floods, and other natural and manmade incidents, and manage public safety at major public events such as the Super Bowl LI at NRG Stadium and the World Series at Minute Maid Park.